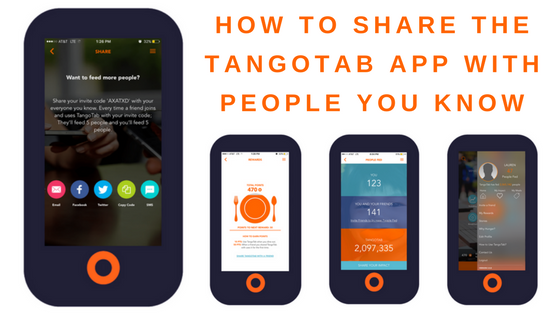 Do you know how to share TangoTab with your family and friends? In this post, we break down the ways that you can get people you know involved in the fight to end hunger. The TangoTab app makes it easier than ever for individuals to fight hunger in their communities! Every time someone checks-in using the app, TangoTab donates the cost equivalent of a meal to an organization that provides food to those in need. 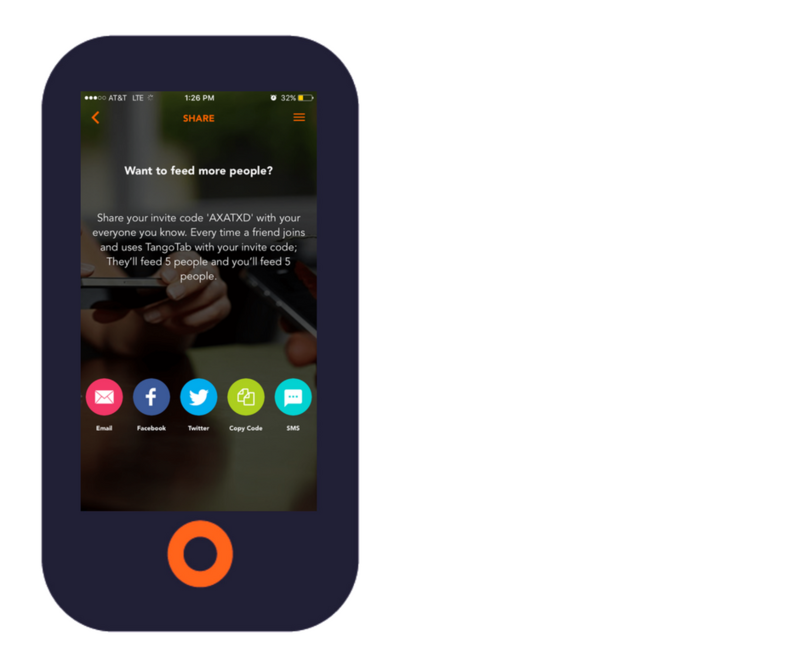 With TangoTab, app users don’t even have to change their routine to actively fight hunger; the app makes it possible for people to join the fight as a part of their regular dining activity. To date, over 2,000,000 meals have been donated because of our app users. Help us bring this number to 3,000,000 (and beyond) by spreading the love and telling people you know about the app! There are several ways to share the TangoTab app through the app itself, and we are going to walk through them in the second half of this post. 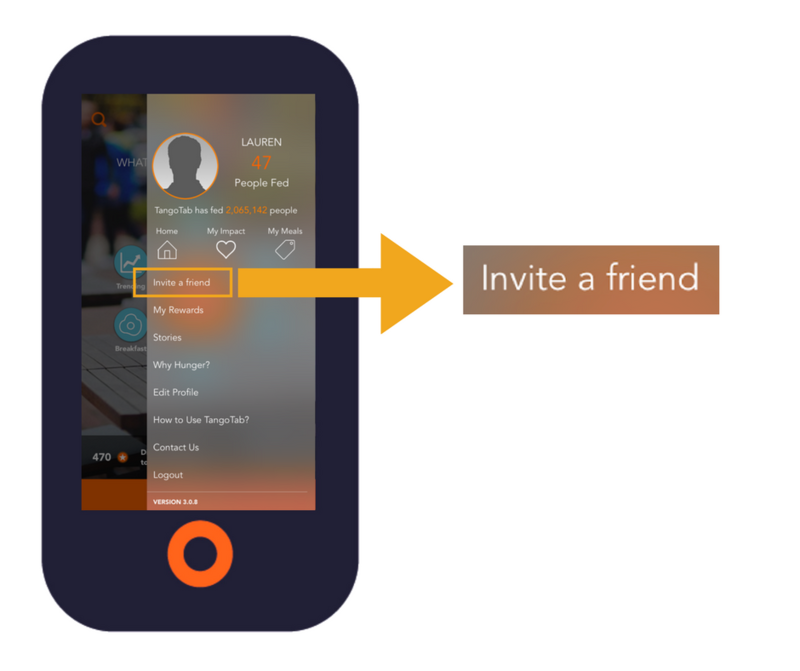 Every TangoTab app user has a SHARE page with their own unique invite code and direct links that allow them to easily share that invite code with others. The SHARE page is pictured below. We are about to show you how to access this page in case you don’t already know! Pull out your phone and follow along if you’d like! If you don’t have the app downloaded yet, you can download it here. 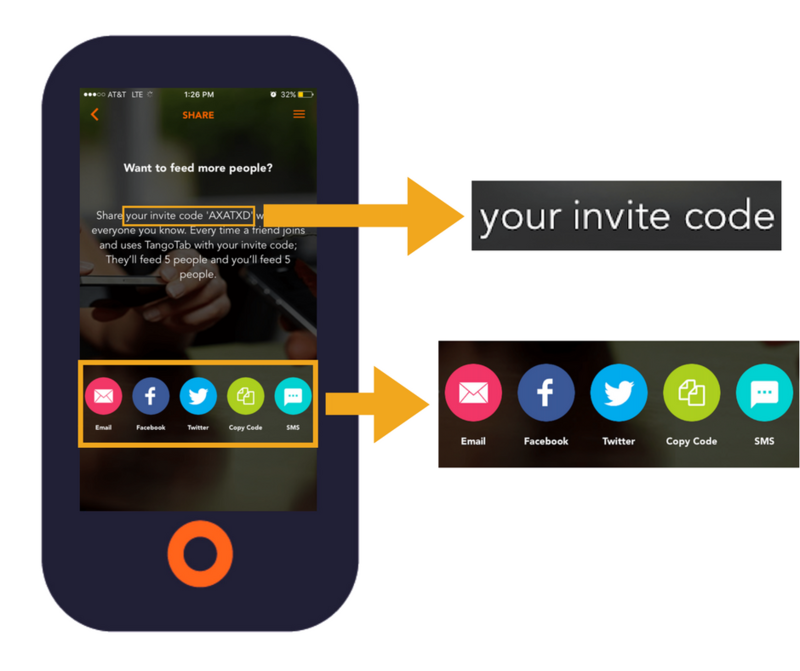 Every app user has their own SHARE page with a unique invite code as well as direct links to spread the word about TangoTab through email, Facebook, Twitter, or text message. 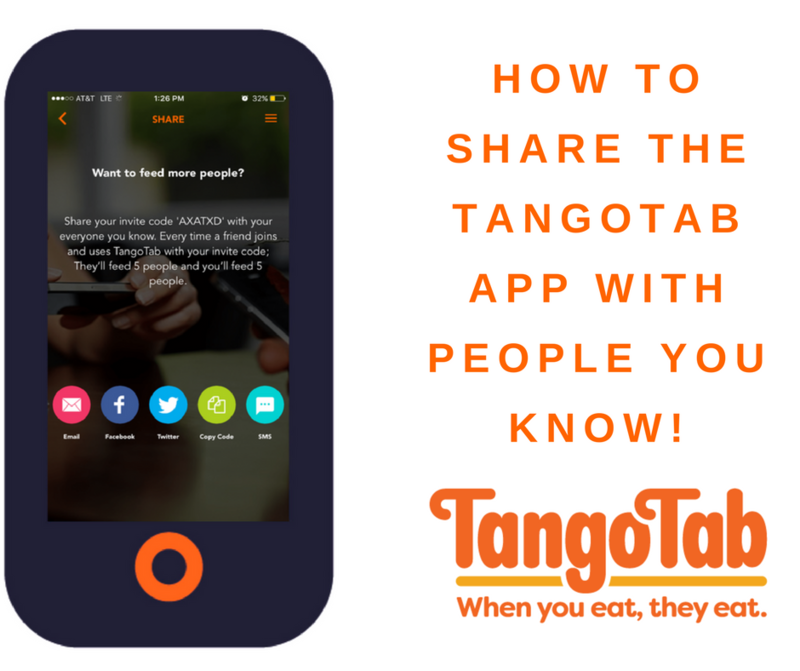 On your SHARE page, you can send information about the TangoTab app directly to people you know via email, Facebook, Twitter, and text message. To do this, simply press any of the icons on the page (pictured below), choose your recipient, and the app will take care of the rest! You can also press the “Copy Code” button to automatically copy your invite code and paste it elsewhere. When you tell someone about TangoTab using these links, and then that person checks-in on TangoTab for the first time, you earn 50 points through our rewards system. Once you’ve earned 500 points, you can either redeem a gift card or feed 50 more people in need. 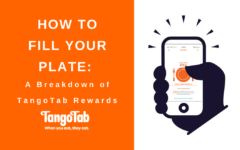 Learn more about the TangoTab rewards system here. 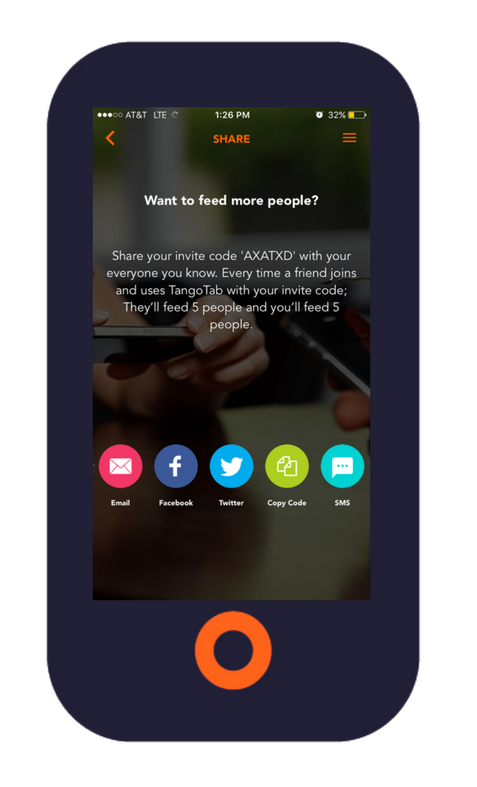 On the SHARE page, you can view your invite code, automatically copy it, and/or send your code and information about the TangoTab app to people you know by tapping on any of the icons near the bottom of the page. 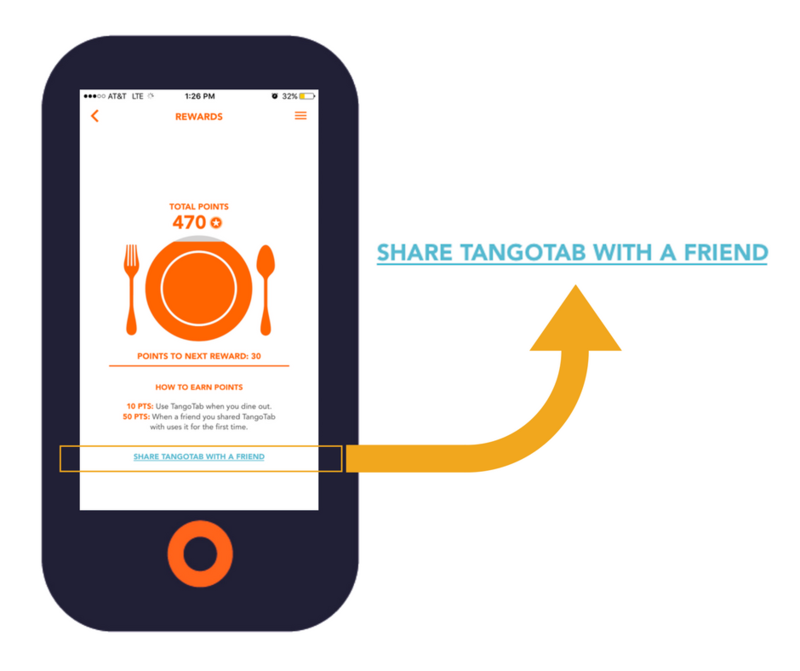 1) Through your REWARDS page— For those following along on your phones, open the TangoTab app. You should now be on your homepage. 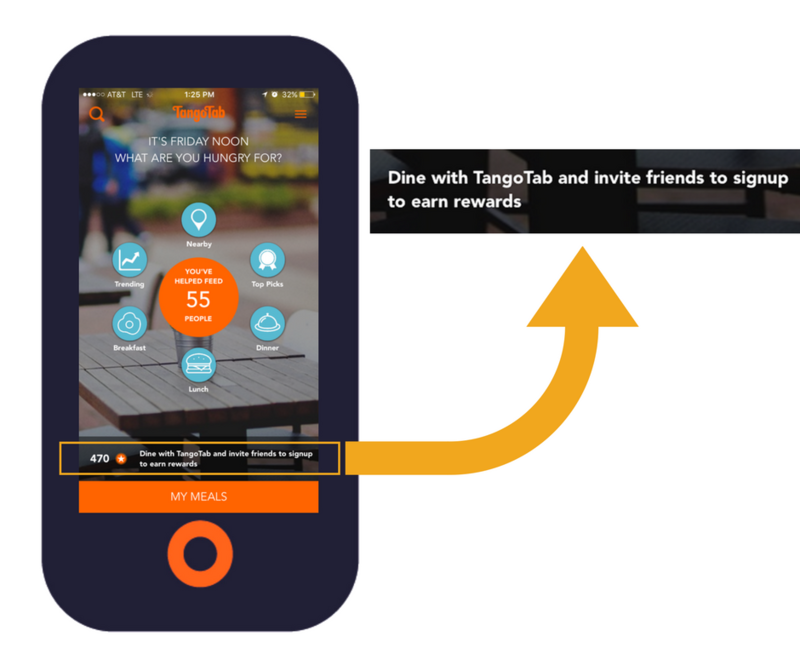 To access your SHARE page through the REWARDS page, tap the button that says, “Dine with TangoTab and invite friends to signup to earn rewards.” This button is located directly above the orange “MY MEALS” button at the bottom of your screen. You should now be on your REWARDS page. If you don’t know how the rewards system works yet, read this post. Now, click the underlined button in blue near the bottom of the screen that says, “SHARE TANGOTAB WITH A FRIEND.” You will now be on your SHARE page! Click the button that says, “SHARE TANGOTAB WITH A FRIEND” to access your SHARE page from the screen with your rewards plate. 2) Through your menu icon— You can also access your SHARE page by tapping your menu icon. The menu icon is always in the top right corner of any page you are on in the app, and looks like three orange bars stacked on top of each other. Tap the menu icon. The menu icon is always in the top right hand corner of the TangoTab app, and looks like three orange bars stacked on top of each other. When you click on the menu icon, your profile will pop up! On your profile, find the first item on the list that says, “Invite a friend,” and tap this button. 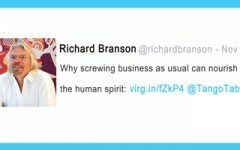 This will take you directly to your SHARE page. The “Invite a friend” button on your profile will take you directly to your SHARE page. 3) Through your PEOPLE FED page— If you are following along on your phone, go back to your homepage. Now open your PEOPLE FED page. 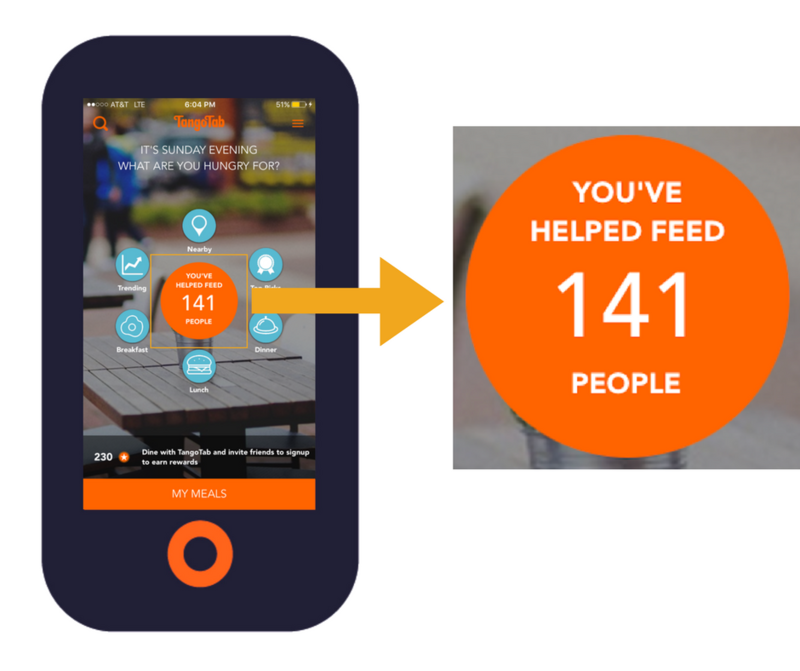 To access this page, tap on the large orange circle in the center of your screen that shows the number of people you have helped feed. Click on it! Click on the large orange circle in the center of your homepage to access your PEOPLE FED page. You are now on your PEOPLE FED page. On this page, you can see how many people you personally have fed, how many people you and your friends have fed, and how many people the collective TangoTab community has fed so far. 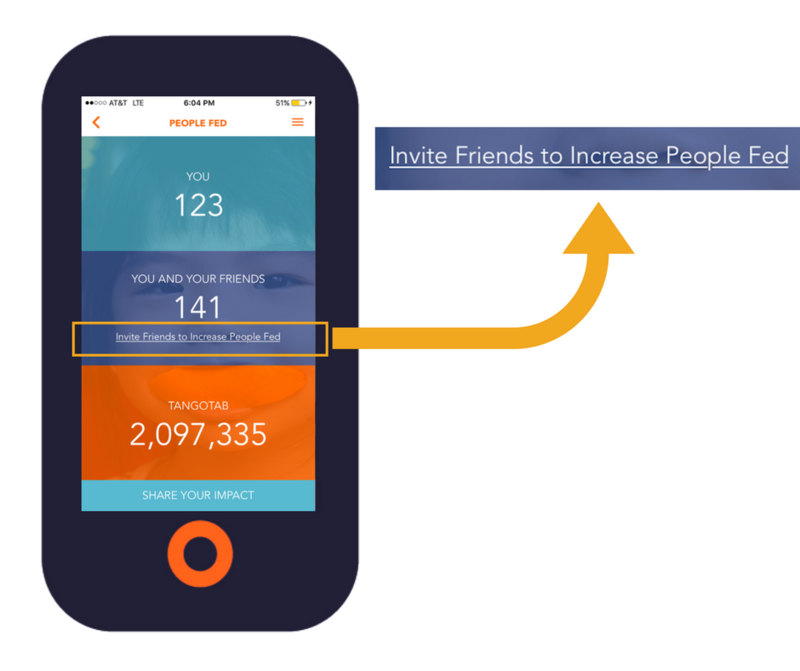 Look for the button in the middle of the page that says, “Invite Friends to Increase People Fed.” Click it! You should now be on your SHARE page. Thank you for doing your part to help others join TangoTab’s fight to end hunger. You are awesome! What do you think of this breakdown? Let us know your thoughts in the comment section. Don’t have the app yet? 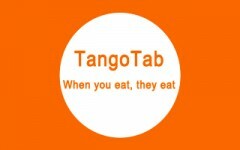 Help us end hunger and DOWNLOAD TANGOTAB TODAY!